This page shows the information regarding the TOUGHPAD / TOUGHBOOK Support (hereinafter referred to as "Support") for Panasonic TOUGHPAD / TOUGHBOOK Android™ Tablet. This page announce the current state of TOUGHPAD / TOUGHBOOK server. Server maintenance has been completed. For too much download time or connection fail, please retry later. After system version up on 26th September 2018, FOTA may become fail regarding state of terminal. Data initialaization is required for following model (before Android 4.4). Please confirm the following page for initialization procedure. For other models (Android 5.0 or later), please wait (for about 1 week at longest) and retry FOTA operation. This page shows the released information and the schedule of updating modules for FZ-A2A Series. We announce FOTA(Firmware Over The Air) information of update up firmware for FZ-A2A Series. Fixed that format completion message might not be displayed on some USB storages. Hardware Diagnostic app: Added support for displaying permission information of each application. Improved operation of waking up from sleep mode when wired-LAN is connected. Improved operation of GPS and Bluetooth Low Energy device. (Only for Wireless-WAN model) Improved operation of Wireless-WAN device. Changed animation of start screen. Added function to receive IPv4 Wi-Fi Multicast and Broadcast. Added enable/disable function for each hardware button. Translated some of English notations into Chinese. (Only Barcode Reader model) Improved software trigger function. Please refer to "5. Precautions" before updating. Modules transmitted after schedule sequentially are as follows. There is no plan to module delivery schedule from FOTA. Please see "4. System Software Update". This page shows the released information and the schedule of updating modules for FZ-B2D Series. We announce FOTA(Firmware Over The Air) information of update up firmware for FZ-B2D Series. Applied Android security patches with issue of KRACKs. Improved logging function of Hardware Diagnostic application. Added Bluetooth Low Energy sensitivity enhancement menu on settings application. Improved Barcode scanner function after resume. Improved shutdown function of LAN model. This page shows the released information and the schedule of updating modules for FZ-B2B Series. We announce FOTA(Firmware Over The Air) information of update up firmware for FZ-B2B Series. This page shows the released information and the schedule of updating modules for FZ-L1A Series. This page shows the released information and the schedule of updating modules for FZ-N1E Series. We announce FOTA(Firmware Over The Air) information of update up firmware for FZ-N1E Series. It is impossible to be downgraded to previous version after firmware update. Apply the Android Security Patches. Fix the issue that network connection occasionally failed with VzW SIM. Modify calculation of battery level using degraded battery. In firmware version at the time of product shipment, can't be downgraded from "After RM181-15-02-002-047" to "Previous version before RM181-15-02-002-047". Update the Kitting Tool Application. In firmware version at the time of product shipment, can't be downgraded from "After RM181-15-02-003-022" to "Previous version before RM181-15-02-003-022". This page shows the released information and the schedule of updating modules for FZ-N1A/C Series. We announce FOTA(Firmware Over The Air) information of update up firmware for FZ-N1A/C Series. Fix the issue that date and time are initialized by pressing and holding the power key even after rebooting. Fix the issue that barcode can not be read with ANR (Application Not Responding) occurred. The setup wizard (initial setting screen) can be skipped. In firmware version at the time of product shipment, can't be downgraded from "After RM151-13-04-001-023" to "Previous version before RM151-13-04-001-020". In firmware version at the time of product shipment, can't be downgraded from "After RM151-13-02-002-034" to "Previous version before RM151-13-02-002-032". In firmware version at the time of product shipment, can't be downgraded from "After RM151-13-02-003-032" to "Previous version before RM151-13-02-003-031". This page shows the released information and the schedule of updating modules for FZ-N1A Series. We announce FOTA(Firmware Over The Air) information of update up firmware for FZ-N1A Series. Apply the Android security patches (Include security patch against 'Meltdown'). In firmware version at the time of product shipment, can't be downgraded from "After RM151-12-04-001-041" to "Previous version before RM151-12-04-001-036". In firmware version at the time of product shipment, can't be downgraded from "After RM151-12-02-002-051" to "Previous version before RM151-12-02-002-046". In firmware version at the time of product shipment, can't be downgraded from "After RM151-12-02-003-036" to "Previous version before RM151-12-02-003-035". 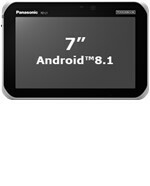 FZ-N1A Series System Software OS Version Updates from Android™5.1.1 to Android™6.0.1. Please be sure to read the "Important matters and Restrictions" for details of this Update, including other precautions. You can update the software while leaving data such as camera images, e-mails, and downloaded data registered to this device. However, the data may not be protected depending on the status of your unit. We recommend that you back up your important data. If you perform a version update. you cannot revert to a previous version of Android. Applications compatible with old OS versions may not work properly. Performing a version update will reset some settings. Please configure them again. If the tablet is encrypted, a screen for inputting a password for decryption is displayed when restarting after the rewriting process. You must input the decryption password. This page shows the released information and the schedule of updating modules for FZ-T1B Series. We announce FOTA(Firmware Over The Air) information of update up firmware for FZ-T1B Series. Fix the issue that DUT can not connect to car navigation via Bluetooth. Fix the issue that app can not get the Battery Health information via Intent API. Fix the issue that Google Play Store sometimes crashes at app install timing. Fix the issue that DUT sometimes can not turn on NFC at Setup wizard. The firmware on FZ-T1 with the version RM172-15-04-020-042 or later cannot be downgraded to "Previous version of RM172-15-04-020-042". This page shows the released information and the schedule of updating modules for FZ-X1A/C Series (Android™5.1.1). We announce FOTA(Firmware Over The Air) information of update up firmware for FZ-X1A/C Series (Android™5.1.1). Apply the Google Security Patches (Include security patch against BlueBorne and WiFi vulnerability). Fix the issue that NFC does not be responded on some condition. In firmware version at the time of product shipment, can't be downgraded from "after tcd_tough-12-01-014-015" to "tcd_tough-12-01-014-013". In firmware version at the time of product shipment, can't be downgraded from "after tcd_tough-12-01-014-017" to "tcd_tough-12-01-014-013 and 015". In firmware version at the time of product shipment, can't be downgraded from "after tcd_tough-12-01-003-021" to "tcd_tough-12-01-003-017". In firmware version at the time of product shipment, can't be downgraded from "after tcd_tough-12-01-003-022" to "tcd_tough-12-01-003-021". In firmware version at the time of product shipment, can't be downgraded from "after tcd_tough-12-01-003-023" to "tcd_tough-12-01-003-022". In firmware version at the time of product shipment, can't be downgraded from "after tcd_tough-12-02-002-017" to "tcd_tough-12-02-002-013". In firmware version at the time of product shipment, can't be downgraded from "after tcd_tough-12-02-002-018" to "tcd_tough-12-02-002-017". In firmware version at the time of product shipment, can't be downgraded from "after tcd_tough-12-02-009-036" to "tcd_tough-12-02-009-030 and 030". In firmware version at the time of product shipment, can't be downgraded from "after tcd_tough-12-02-009-041" to "tcd_tough-12-02-009-036 and 036". This page shows the released information and the schedule of updating modules for FZ-X1A Series (Android™4.2.2). We announce FOTA(Firmware Over The Air) information of update up firmware for FZ-X1A Series (Android™4.2.2). In firmware version at the time of product shipment, can't be downgraded from "after tcd_tough-10-300-01-014-016" to "tcd_tough-10-300-01-014-007, 009, 011, 013 and 014". In firmware version at the time of product shipment, can't be downgraded from "after tcd_tough-10-300-01-014-018" to "tcd_tough-10-300-01-014-007, 009, 011, 013, 014 and 016". In firmware version at the time of product shipment, can't be downgraded from "after tcd_tough-10-300-01-014-020" to "tcd_tough-10-300-01-014-007, 009, 011, 013, 014, 016 and 018". Fix the issue that barcode settings may not be taken over correctly after FOTA. Fix the issue that in a specific VoIP application, the first call fails after the device starts up. In firmware version at the time of product shipment, can't be downgraded from "after tcd_tough-10-300-01-003-049" to "tcd_tough-10-300-01-003-033, 036, 043, 046 and 047". In firmware version at the time of product shipment, can't be downgraded from "after tcd_tough-10-300-01-003-057" to "tcd_tough-10-300-01-003-033, 036, 043, 046, 047 and 049". In firmware version at the time of product shipment, can't be downgraded from "after tcd_tough-10-300-01-003-059" to "tcd_tough-10-300-01-003-033, 036, 043,046, 047, 049 and 057". Fix the issue that NFC does not be responded on some condition.. In firmware version at the time of product shipment, can't be downgraded from "after tcd_tough-10-300-02-002-030" to "tcd_tough-10-300-02-002-018, 024 and 026". In firmware version at the time of product shipment, can't be downgraded from "after tcd_tough-10-300-02-002-032" to "tcd_tough-10-300-02-002-018, 024, 026 and 030". In firmware version at the time of product shipment, can't be downgraded from "after tcd_tough-10-300-02-002-034" to "tcd_tough-10-300-02-002-018, 024, 026, 030 and 032". In firmware version at the time of product shipment, can't be downgraded from "after tcd_tough-10-300-02-009-022" to "tcd_tough-10-300-02-009-017, 020 and 021". In firmware version at the time of product shipment, can't be downgraded from "after tcd_tough-10-300-02-009-025" to "tcd_tough-10-300-02-009-017, 020, 021 and 022". In firmware version at the time of product shipment, can't be downgraded from "after tcd_tough-10-300-02-009-028" to "tcd_tough-10-300-02-009-017, 020, 021, 022 and 025". OS update function is implemented. * In firmware version at the time of product shipment, can't be downgraded from "after tcd_tough-10-300-01-020-009" to "tcd_tough-10-300-01-020-008". Module Delivery Schedule was changed from August 29, 2016 JST to Oct 3 2016. FZ-X1A Series System Software OS Version Updates from Android™4.2.2 to Android™5.1.1. This page shows the released information and the schedule of updating modules for JT-B1 Series. We announce FOTA(Firmware Over The Air) information of update up firmware "V09-1107" for JT-B1APAAZAM, JT-B1APAAZCZ, JT-B1APAAZ1M, JT-B1APAAENA and JT-B1APAAETQ. Add Google Folder and place application icons. Delete vibration on "dumpstate" operation. Modules are sequentially transmitted after May 10, 2016 JST. This page shows the released information and the schedule of updating modules for FZ-A1 Series. We announce FOTA(Firmware Over The Air) information of update up firmware "V1.00L65M0000", "V1.01L65M0000", "V1.05L65M0000", "V1.06L65M0000" and "V1.07L65M0000" for FZ-A1B (mk2). Updating is available between same firmware SKU (e.g. from V1.01L47M0000 to V1.01L65M0000). Please be advised FOTA update cannot be performed in Tablets using the firmware versions V1.01L36M0000, V1.02L36M0000, and V1.02L36M0002 with Storage Encryption enabled. If this is the case, please use microSD card for update or execute Factory Data Reset to disable Storage Encryption. Modules are sequentially transmitted after Feb 22, 2016 JST.